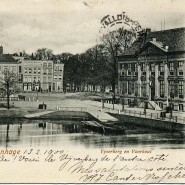 Postcard from the Hofvijver (the pond on the foreground). The street along the water is the Vijverberg. The trees in the middle are on the Voorhout street. The Hofvijver (litt. Court Pond) is a medieval pond, next to the Binnenhof (Inner Court) buildings. It featured on this blog a few times before. 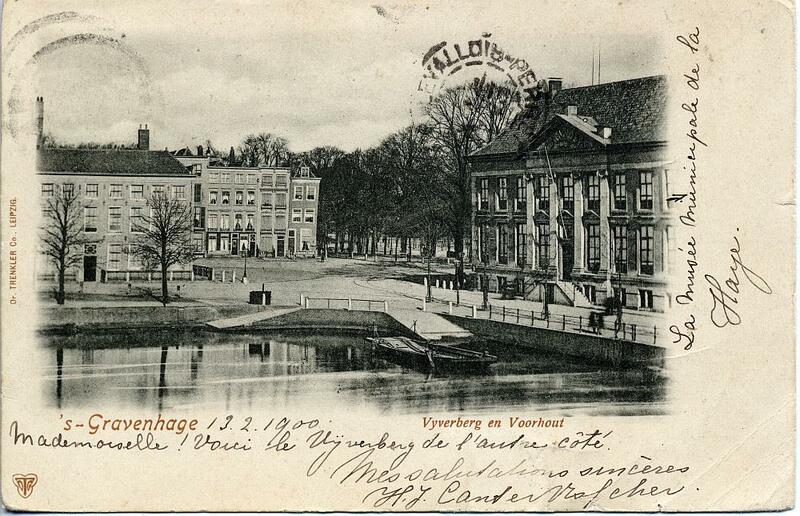 Most photos of the Hofvijver include the buildings of the Binnenhof on the background, but, as the sender noted, the photo on this card is taken “de l’autre côté“, from the other side, with the Binnenhof behind the photographer. The card was sent to Paris in 1900. Apparently it returned to The Hague later, because I bought it there on a book market just a few years ago. 13.2.1900 Mademoiselle! Voici le Vijverberg de l’autre côté. Mes salutations sincères H.J. Canter Visscher. 13 Feb 1900 Miss! Here is the Vijverberg from the other side. My sincere greetings, H.J. Canter Visscher. This post is submitted to the 4th edition of A festival of postcards.